My Journey to Fit: 2019 Texas 10 Series 5 Miler Race Recap! 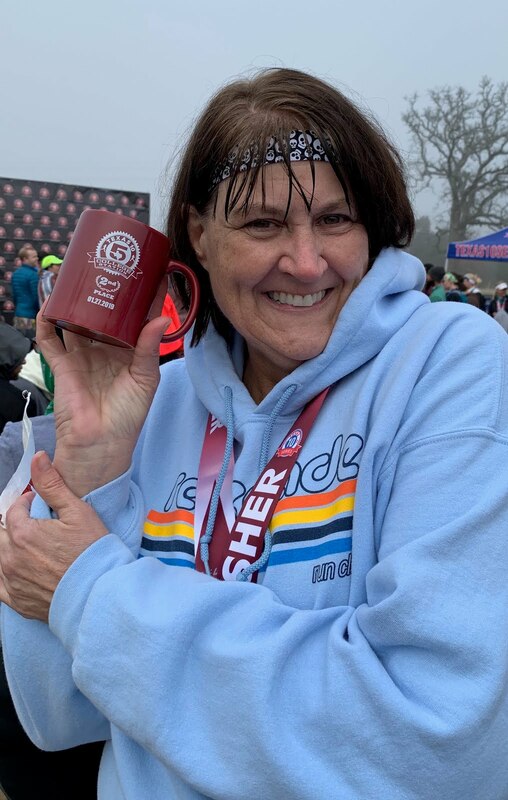 2019 Texas 10 Series 5 Miler Race Recap! This year's medal - doesn't get more Texas-looking than this! 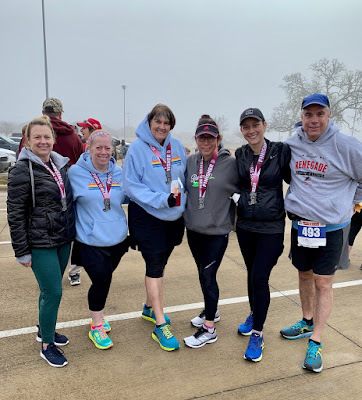 On Sunday I and most of the Renegades ran the Texas 10 Series race, which is year four for me. 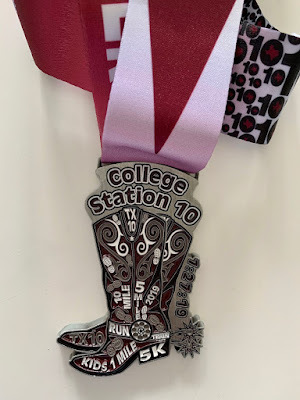 It's an easy one to run because the route is local, and it's not on the campus of Texas A&M, which means it's simple to get to and park at. Also, we try to register during their opening hour of bonanza pricing; if you can hit that before the allotted number of spots at the low prices sell out, you can get a good deal. This year I paid $20 for the five mile race and $25 for the ten miler race, which is pretty cheap considering you get a race t-shirt, a medal, a prize if you happen to win your age group (several of our Renegades have done this over the years), and you might be lucky enough to have your bib number drawn after the race and win some cash, which three of our members did last year. 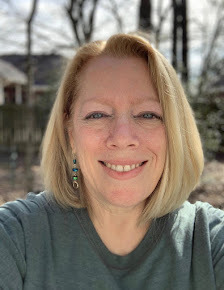 This year's T-shirt - I've finally learned to order a men's large instead of any of the women's sizes are they are incredibly small (their website says they run two sizes small...maybe choose a different brand, then?). Anyway the shirt is soft and fits me, and will go into my workout shirt rotation. We all arrived around 6:30 am for the 7:00 am start. It was another cold morning - 43 degrees - which is good for running. Karen, Diane, and I were doing the 5 miler while Jeff, Cary, and Julia were doing the 10 miler. 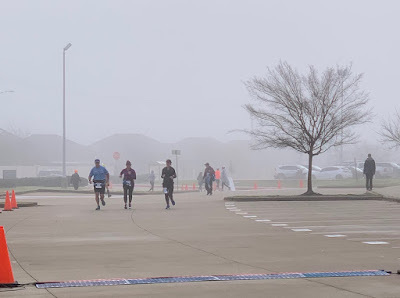 This race is well-organized and it started on time; one thing new this year is that they broke up the starts of the different distances, so the 10 milers started and then about five minutes later the 5 milers started. 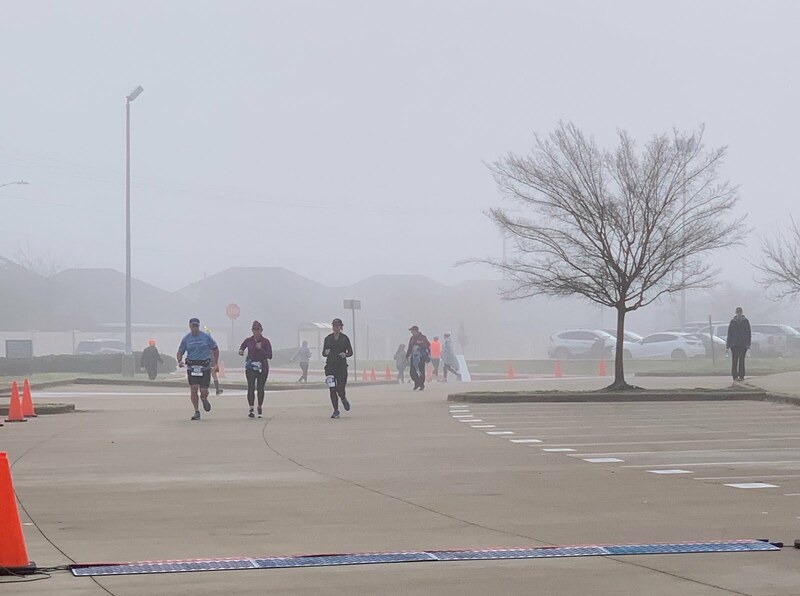 There was also a 5K and a kids mile, so pretty much anyone who wanted to participate could find a distance that they liked. We watched the 10 mile group take off and then it was our turn. Because the groups were separated, we ended up very close to the start line to begin, and that meant that Diane and I had to run pretty darn fast right off the bat to avoid getting run over. Not really, but we didn't want to impede anyone behind us. 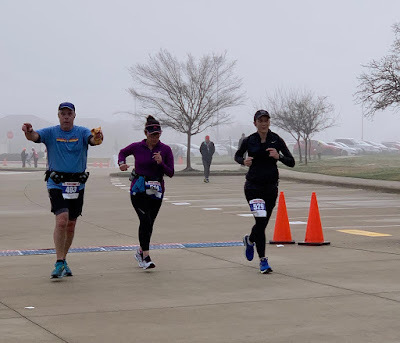 Even though we were able to settle down into our normal pace fairly quickly, that fast start gave us our fastest mile of the race. I was wearing my standard winter running gear - lined long-sleeved shirt, windbreaker over that, neck buff, gloves, and my two layers of capris and running skirt and I was comfortable; I didn't take off the windbreaker and gloves until we were almost at mile 3. 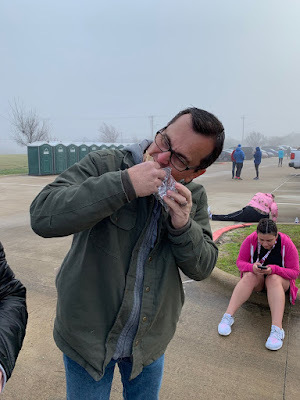 I kind of regretted that as we neared the finish because fog had rolled in and it was damp and cold! About the finish. For most of the race Diane and I had followed a woman and had finally passed her in the last half mile. The route has you run partway down a side street and then turn around and run to the finish line, which is uphill from the turnaround on. The woman passed us after we did the turnaround, and I'll be honest, I was getting tired and slowing down, so she was getting more and more ahead of us. We hit the final tenth of a mile - the finish line was in sight - and I could tell Diane was itching to pass the woman again. I told her to go ahead as I thought I was just about out of gas, so she did, and passed her so fast that I thought well heck, I bet I can pass her as well, so I gunned it and sure enough beat her across the finish line. I rarely "race" my races so this was kind of fun, actually. You work up an appetite spectating! Side note: Later on at Blue Baker, Jimmy finished his breakfast and got up to clear his plate, leaving most of a ciabatta roll uneaten. Karen was all "What are you doing? Give me that!" It was funny because normally Jimmy finishes the uneaten food from everyone, but those breakfast tacos filled him up. What is the deal with me spending the last two Sundays with frozen fingers and toes while waiting for Jeff, Cary, and Julia to finish?! We were not wearing enough warm clothes and were pretty much icicles here. 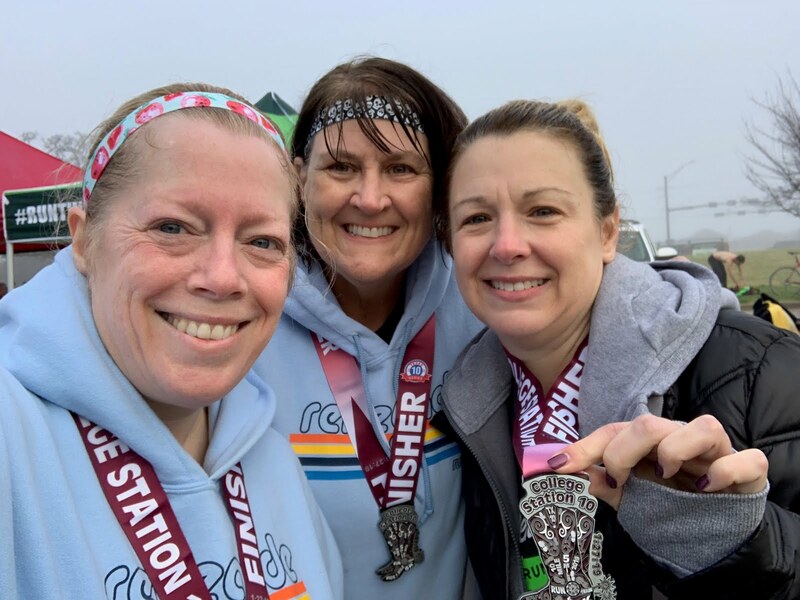 After last week's marathon, this 10 mile race was no big deal for them. Karen, me, Diane, Julia, Cary, and Jeff. Jimmy was taking the picture and directed our forward foot pose so that's why we look like models here. A coffee mug! She can drink the sweet taste of victory from it. Oh heck yes! One hundred simoleons! Jeff won last year as well, and we'll be putting it toward the same thing as last year - new running shoes for him. 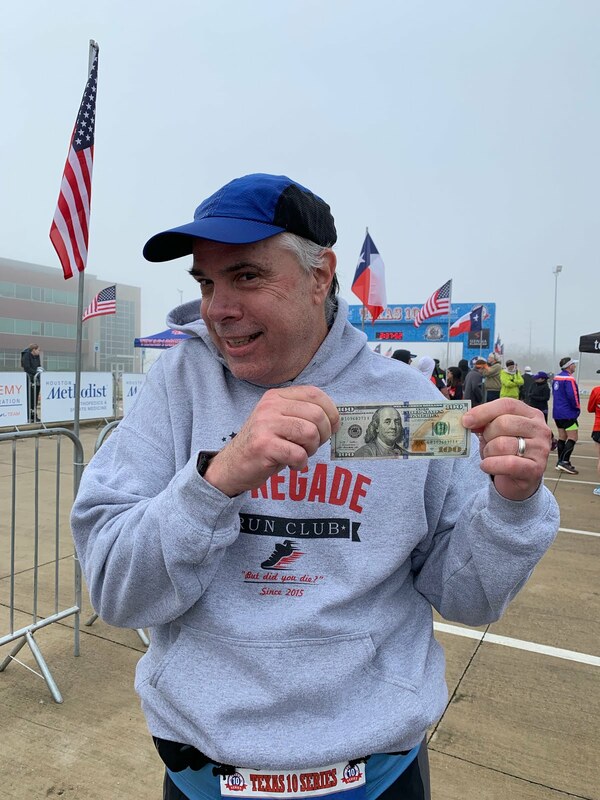 All in all, even though it was rough to be so cold after the race, it was another fun morning spent with the Renegades. 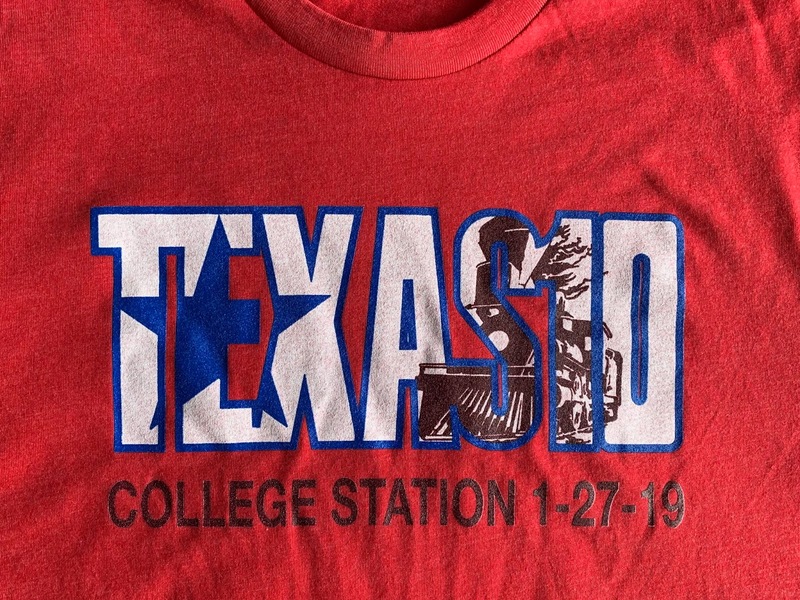 See, I need to come to Texas. Between your medals and cash prizes I wouldn't actually mind paying to run a race. Around here you get zip until you win your age group. Seriously, CT needs to take some pointers from TX! I was sort of chuckling at your outfit though - you are definitely TX heat adapted because at 43 degrees it would feel warmish so I would wear a pair of running pants, a mock neck shirt and a vest. LOL. The medal game has stepped up here since I started running - back then you didn't get one unless you ran a half. Out of the five races I'm doing this year so far, only one doesn't have a medal (but you get to high five Chuck Norris at the end, so...). And yes, I'm definitely TX heat adapted! Does it help if I say it was a wet cold? Because that fog, eeek. Shivering just thinking about it! CHUCK NORRIS!!!! I wonder if I told Bobby he'd fly us down to do the race? hahahaha! Well if he's interested, sign up today - they are capping the race at 5,000 and in less than two weeks since registration opened, they are at 4,500. CRAZY. But it's an event, so it'll be fun. It sounds like a fun race!!! You guys always have so much fun at your races! Congrats to all! I'm kind of agreeing with Helen above--43 sounds kind of warm to me! Perfect for running, actually and I'd be in capris and a pullover. Boy, Jeff sure is lucky!! Winning money at two races. This sounds like you all had a really good time at this race. So fun to see all the pictures too. LOL @ you guys yelling re-draw! And congrats to Jeff! Yay! I can't believe he ran 10 right after a marathon. WTG! And wtg on your race! Good thing Diane passed that lady, phew! She would have been kicking herself to see she missed that podium spot! I am glad you dressed what felt right to you! It must be annoying to write on here about your weather and get all the comments about how not cold that is. Chill out, northerners. Geesh. Well, when we're running in -15 windchills, 43 feels warm. Plus we always compliment Shelley on running in her high humidity. No harm is meant by the comments, so you chill out.